Welcome to February’s bumper Network Update. This month; Green Deal interest rates announced; breakfast presentations and dates; LED lighting update; community solar project; opportunity to exhibit at the Eco-Technology Show. The government’s Green Deal initiative allows householders and businesses to take out a loan to finance the installation of energy efficiency technologies, such as insulation, double-glazing or solar panels. The loan is paid back through instalments attached to the premises’ electricity bills. Including administration fees, a £5,000 loan with a ten year payment plan will have an interest rate of 7.96%. Interest rates. Green Deal information. The Sustainable Business Network has sponsored an area at the Eco-Technology Show at the Brighton Centre on the 14th and 15th June at we have a limited number of spaces available exclusively for Network Members wishing to exhibit. We’ll be turning the space into a one-stop-shop for sustainable building solutions and are looking for exhibitors who can offer energy, water, waste or other sustainability products or services. Full details and contacts. Presentations from January’s Sustainable Business Breakfast focusing on sustainable procurement are now on-line. Our next breakfast, on the 21st March in Chichester, will focus on efficient technologies. We’ll hear from The Southern Co-operative, about how they have improved energy efficiency in their stores, as well explore with industry experts the pros and cons of voltage optimisation and air-source heat pumps. Event details. 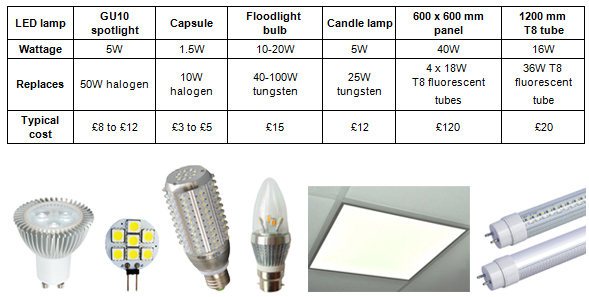 The below table shows the typical wattage and cost of a range of LED lamps, as well as the lamp types they can be used to replace. LEDs have an average lifespan of 30,000+ hours, compared to 15,000 hours, 2,000 hours and 1,000 hours for fluorescent, halogen and tungsten lighting respectively. Search for local suppliers in our on-line Sustainable Business Directory. The second Smart Business Conference will be held at The Eco Technology Show in the Brighton Centre on the 14th of June 2013. The free to attend, one day event will address opportunities for business and the public sector to lower costs and increase return on investment through more efficient and sustainable resource usage. The organisers are keen to hear the topics you would like covered – spend 5 minutes to share your views and help shape the conference programme.